The part of the stem of an embryo or of a seedling between the radicle and the cotyledons. The hypocotyl is the equivalent of the stem in a germinating seedling. 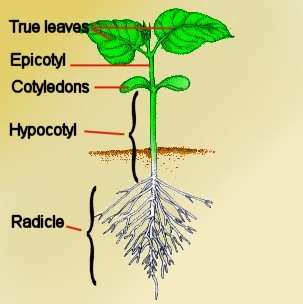 The vegetative axis below the cotyledons and above the radicle, which is responsible for initial upward elongation growth and develops into the stem.